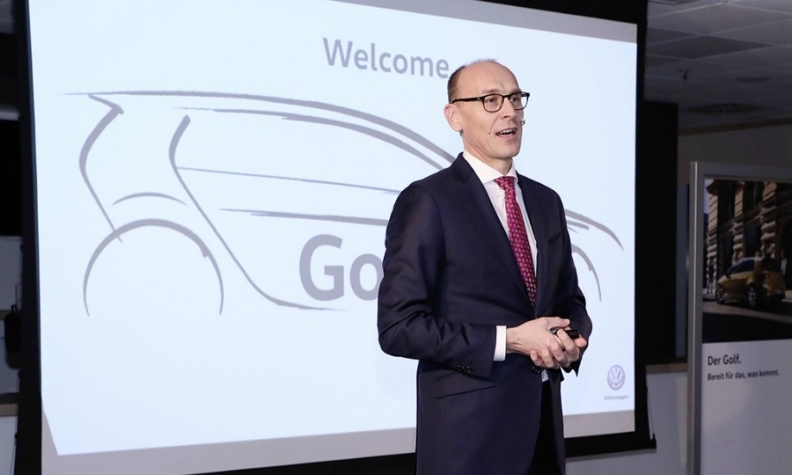 FRANKFURT -- Volkswagen wants the next Golf to become the benchmark in safety and connectivity, when the hatchback begins production in late 2019. VW is investing about 1.8 billion euros in the latest, eighth-generation Golf, the automaker said in a statement. The Golf is Europe's best-selling car and a key model for VW. The new generation will face internal competition from VW brand's I.D. family of affordable electric vehicles. VW will start production of the Golf-sized I.D. battery-powered hatchback at the same time as the new Golf at the end of next year. It will go on sale in 2020 at a price comparable to a Golf diesel. Golf sales fell 2 percent to 444,226 in Europe through November 2017, according to data from JATO Dynamics. The car accounted for almost a third of VW brand's volume. Its sales easily surpassed the 296,856 units achieved by Renault's subcompact Clio, Europe's No. 2 seller.